Aviation enthusiasts have another way to display their love for flying in Idaho. By purchasing a "Fly Idaho" license plate, they will also be supporting organizations that work to preserve and enhance the airstrips that help make Idaho a special place for pilots. This fantastic product is due to the persistence of the Idaho Aviation Foundation's own Larry Taylor who shepherded it through the state legislative process for over a year. In addition to the regular registration fee, the specialized plates will cost an extra $35 initially, and $25 at renewal. If your plates are not immediately due for renewal any remaining registration time will be credited to the new plate. Customized numbers and letters, such as an aircraft's N number will cost another $25 initially, and $15 at renewal. Only five characters are available on the plates, so you may not be able to have the "N" on it. Sample plates, suitable for hanging on your wall (but not on your vehicle) are available for $30. Sales of these plates do not apply to the 1000 plates needed to keep the program going. Roughly one-half of the license plate sales proceeds will go to the Idaho Aviation Foundation. The rest will stay with the Idaho Transportation Department for administration purposes. The plates are available at the usual county vehicle registration offices and online at itd.idaho.gov/itddmv/?target=registration-plates. If it's not time to renew your registration and you haven't received a reminder card in the mail click on "Registration Status Checker" on the right side and follow the instructions. 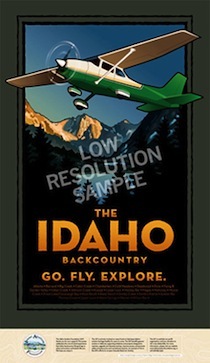 On February 1, 2013 the Idaho Aviation Foundation announced it's plan to rebuild Idaho's historic Big Creek Lodge www.rebuildbigcreek.com. For over 74 years the lodge provided meals and lodging to miners, geologists, loggers, sportsmen, horsemen, hikers, ATV/Snowmobilers, and pilots. Big Creek is special from an historic standpoint, but the mountain views, wildlife, and a rustic lodge on a beautiful state maintained airstrip made the Big Creek experience memorable. Sadly, it came to an end one late October morning in 2008, when a fire burned the lodge and adjacent cabin to the ground. Now, the Idaho Aviation Foundation is well on the road to rebuilding the lodge in the next few years. This project is being undertaken to promote Idaho aviation's image with the general public and enable users of all kinds to enjoy this remote location to its' potential once again. The project will be the IAF's premier enhancement to Idaho's backcountry aviation facilities in the coming years, but we need help. If the Lodge has a special place in your heart - or if you would like to enjoy another place for meals and lodging in the backcountry - then we hope you will choose to get involved via donation and/or volunteerism. There are so many details and activities; you may wish to visit our dedicated website for this project: www.rebuildbigcreek.com. Although many have the ability to fly into the Idaho backcountry to enjoy the wilderness, there is a segment of the population who cannot physically or economically access these remote areas. There are those who are physically unable to hike, ride a horse, or float a river, due to age, conditioning or disability. Over 25 years ago several Idaho pilots and air taxi operators, in cooperation with Boise Parks and Recreation Department, decided to start Wilderness Within Reach, a program that provides air transportation to the Idaho backcountry at selected airstrips for such individuals. Today this program is sponsored by the IAF, air taxi operators and volunteers along with the Boise Parks and Recreation Department to conduct the annual event. On July 11th, 2017, thirteen participants met at Jackson Jet Center in Boise to depart for a two night stay at Sulphur Creek Ranch. This year our guests included an amazing group of veterans and their spouses or friends. The veterans ages ranged a few generations from the Vietnam era to the present. This year our air taxi providers included S. P Aircraft, Arnold Aviation, Sawtooth Aviation, and McCall Aviation|AvCenter. Camp hosts included Vic Jaro, John Davis, and Joe Corlett. We could not have asked for finer weather. Skies were clear, and the temperatures were fairly mild for July. The Sulphur Creek crew included managers ValDean and Kiere Schroeder as well as Kim, Meredith, and Elizabeth. The only rival to the beautiful scenery seemed to be the delicious meals prepared by the crew. Activities featured a scenic horseback ride, fishing, hiking, beanbag horseshoes, geo- caching, and chasing shade across the yard. The group came in as strangers and left feeling as if they were family. There were amazing stories told by the vets as well as some of us pilots. The IAF has undertaken the development of tower mounted webcams and weather reporting stations intended for pilots to view actual backcountry weather conditions at selected locations in southwestern and central Idaho. Many locations are now in operation and can be viewed by accessing the Webcams page of this website. The IAF is reviewing the feasibility of continuing such operations in the future and to the extent that such services are desired and utilized by the pilot community, they may be continued. In July of 2014 two webcams were installed at Big Creek, along with a weather station. The cameras show weather to the north and south. In 2011 one webcam was moved to Sulphur Creek and gives pilots a good view east from the lodge. The IAN consists of owners and users of Idaho's backcountry airstrips. The primary purpose is to establish standards and coordinate projects for all public use backcountry airstrips in Idaho. Both the IAF and the Idaho Aviation Association hold key positions on the IAN steering committee. The IAF has become one of the major supporters of the IAN and has been designated as the entity that receives and distributes grants and donations for IAN projects. For more information see the Idaho Airstrips page on the Idaho Aviation Association website. On February 28, 2017, the Idaho Aviation Foundation (IAF) filed a Notice of Intent (NOI) and a Pre-Application Document (PAD) with the Federal Energy Regulatory Commission (FERC). The filing is required to initiate the re-license process for the Big Creek Hydroelectric Project (FERC No. 10721) to allow continued Project operation when the current license, which was issued on March 26, 1992, expires on February 28, 2022. 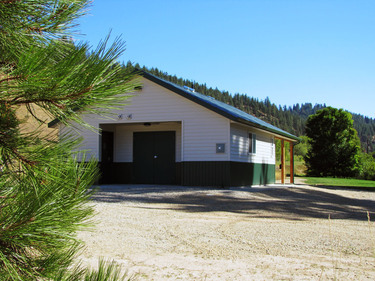 The Project supplies clean, renewable hydro power to Big Creek Lodge located 24 miles Northeast of Yellow Pine, ID. Map and Directions from McCall to Big Creek can be found HERE. Map and Directions from Cascade to Big Creek can be found HERE. The IAF has given grants to local high school STEM (Science, Technology, Engineering, Math) programs conducted by Rich Stowell, a 20-year Master Instructor. Here's a five-minute video memorializing the six-hour ACE Academy Living Lab held at Boise State University on June 14, 2017. The lab brought teens and teachers together to learn about aviation using STEM. Using rubber band powered balsa wood airplanes, participants worked on NASA's Glide Trajectory Problem as well as calculated the speed of their planes flying around pylons. 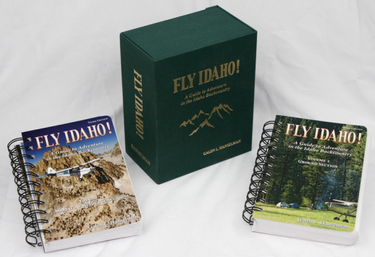 The IAF has funded research necessary for the publication of the Third Edition of Fly Idaho!, a nearly 1,000-page, comprehensive two-volume book that provides critical safety and recreational information about Idaho's backcountry airstrips. This book was published in 2015. 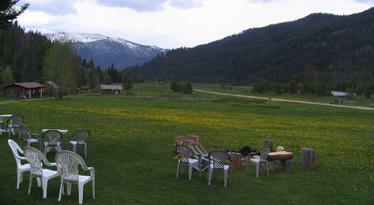 The Garden Valley airstrip is a popular mountain area turf airstrip on the eastern end of Garden Valley located adjacent to the South Fork of the Payette River. 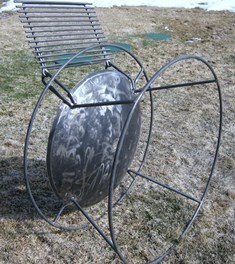 It is located approximately 30 miles north of Boise in a very scenic valley. The airstrip is more easily accessible to backcountry pilots than Johnson Creek and Smiley Creek and has had camping, picnic and toilet facilities available on the airstrip, but no showers until recently. To remedy the shower situation the IAF worked with the state Division of Aeronautics, the Idaho Aviation Association and many volunteers in order to construct facilities at the Garden Valley Airstrip. The shower and restroom facilities were completed for use in July of 2011, and rival other Idaho airports which attract pilots from all over Idaho as well as the rest of the United States and Canada. The Treasure Valley Chapter of the Idaho Aviation Association annually hosts a Father's Day Fly-In Breakfast which is always well attended. The U.S. Forest Service (FS) acquired the Reed Ranch as part of a land exchange in 2006. Prior to FS acquisition the airstrip was privately owned; however, the owner allowed the public to use the airstrip with permission. When the Forest Service acquired the airstrip, an initiative was launched by the state Division of Aeronautics in the Idaho Transportation Department to acquire a Special Use Permit. The Forest Service granted the permit in 2010 and the airstrip was officially opened to the public again in the summer of 2010. A short video of the opening ceremonies is available. The reopening of Reed Ranch airstrip is yet another example of cooperative efforts yielding positive results when public agencies and private interests unite for a common purpose. The IAF will continue efforts to assist the state Division of Aeronautics with improvements at the site to enhance the user experience. In 2012 the IAF funded and contracted with the Forest Service to install new fire pans at the Moose Creek Airstrip (1U1) camping area.